When a Steam skin has its own website and a Patreon campaign to fund development, it’s clear that it has become a popular replacement for the default Steam skin. That’s the case with Pressure skin, a complete overhaul created by designer Dirt Diglett. Pressure skin doesn’t stray too far away from Valve’s original design philosophy. 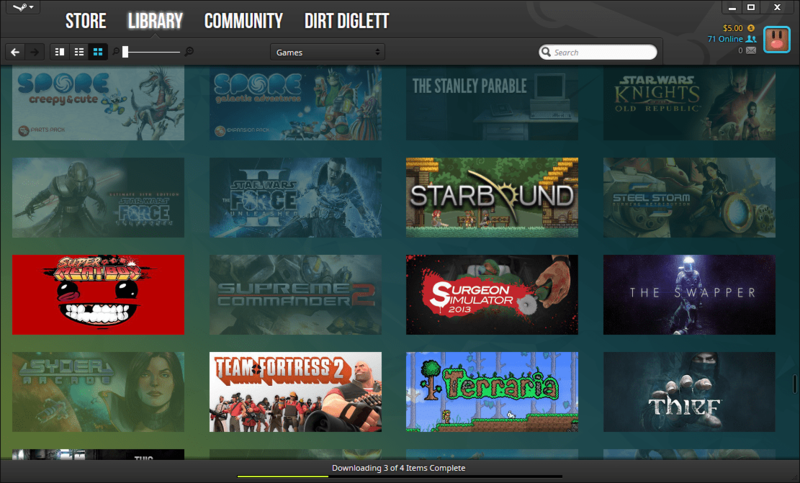 The primary colors are still black and white, and the traditional Steam logo returns to the top-right corner of the header. The drop-down menus have been replaced by a single icon, and the library has received a new drop-down menu for easy switching between games, utilities, music, etc. The font has been changed to the thinner, smaller NotoSans. Text color has been tweaked slightly, although most of it is still white. 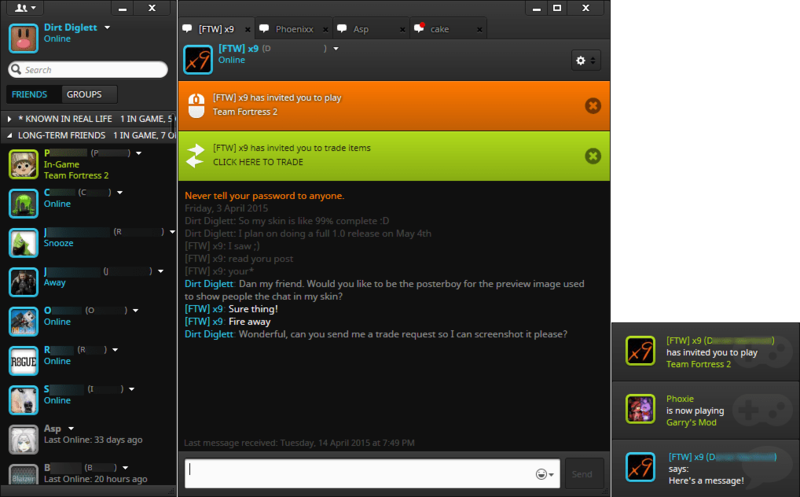 The wallet, Steam chat, and messages icons have been given their own color and unique icon. The header itself is a little thinner than usual, while the section links have been given a bold, all-caps font. Generally speaking, the readability of text within the interface is top notch. However, there is a slight issue with this uninstalled games list being a very faded gray on a black background, which does require some straining of the eyes to read – certainly a good test of a monitor’s contrast! From a usability standpoint, Pressure is top notch. It’s one of those that will require a user to spend a little time learning where settings have moved to. The bright blue highlight accent is a minor, but important change that makes it easy to keep track of the active item within the interface. Pressure skin is one of my favorite Steam skins. It’s sleek, it has good synergy with modern operating systems, and the design looks highly professional. Click on the images below to enlarge and see better! Improved consistency of generic dialogs and wizard dialogs. Improved styling of Achievement Notifications. It got a double folder. Just double click the first folder and then drag the folder in the first folder into the skin folder – A little bit confusing. Hope it helps. Here’s the original pressure skin which is shown in the screenshots. The links posted lead to Pressure 2, which is a completely different version. Fonts do not show as they do in the screenshots. Neither do the the colors, as my backgrounds are all obnoxiously white. Clearly, something has broken at some point and no one cared enough to fix it. 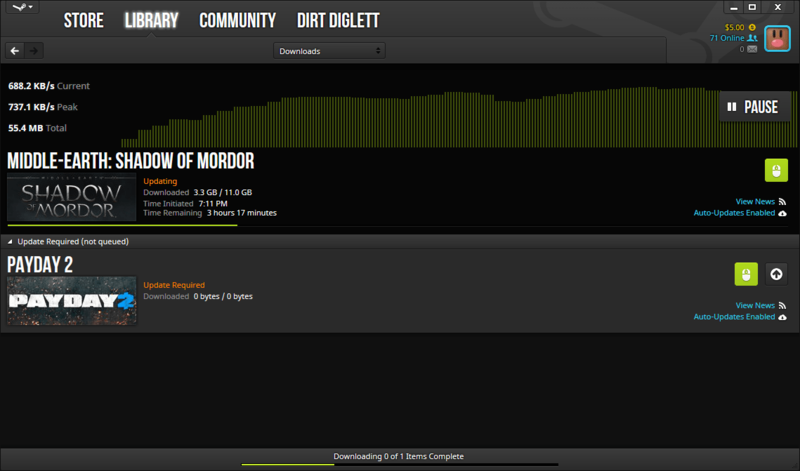 Sorry to say this to you, but when you launch a game that is downloading, the text is scrambled, as in the image above. the game I tried it with was Borderlands 2.
how do i make it black,because right now its white and i dont know how to change the color. Why does the drop-down menu not show “Settings” when in large mode, but it does when it’s in small mode? What is the point? 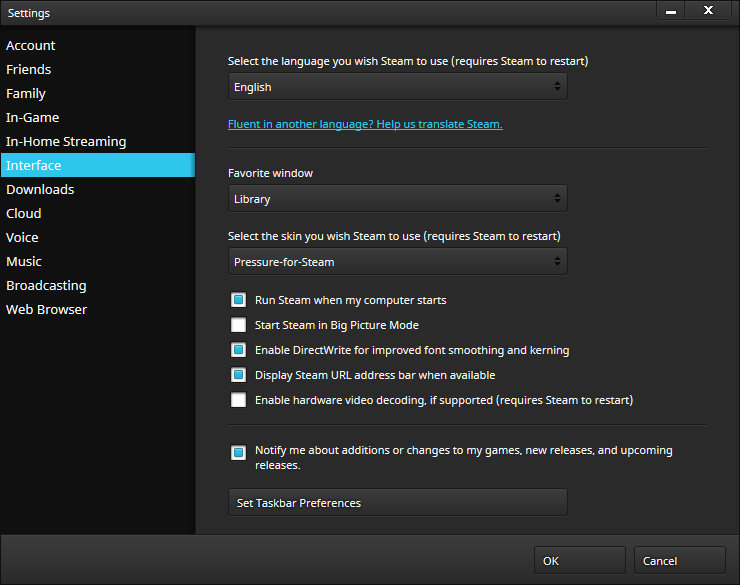 And where the hell is the “settings” option in large mode anyway? I like this skin, but that seems absolutely pointless. I’m actually mad. Turns out I was in family mode…however, the option to click settings still appears in family mode when in small mode. Tiny bug. Gorgeous Skin, I like it quite a lot… although my only critique and it IS a minor one, the main navigation bar (Store, Library… etc) the font size seems to be a few pixels to large that it kind of makes it a bit obtrusive, “quite in your face”, which is a bit of a turn off, but maybe that’s just me… other than that it’s a brilliant skin. Just installed it as of October 9, 2018. Looks great and everything seems fine for the most part. 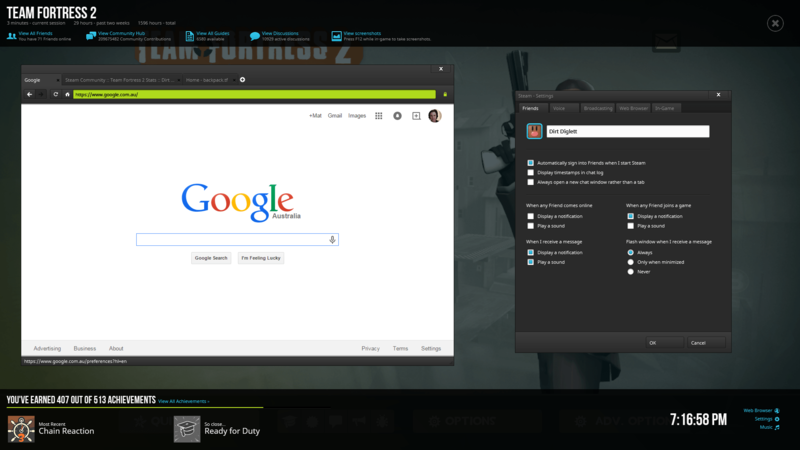 Except my friends list still seems to be the new default stuff, as opposed to your version in the screenshots. 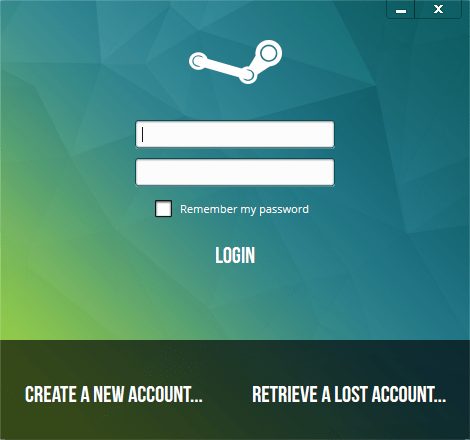 I’m new to modding the steam ui and interface, so any assistance would be appreciated.